I just wanted to let everyone know that, if you are in the San Francisco Bay area, I will totally cut your hair for only $5. While I don’t have any formal experience or training — and frankly, no idea what I’m doing — I can guarantee you a unique new haircut that will get you much more attention than your old haircut. 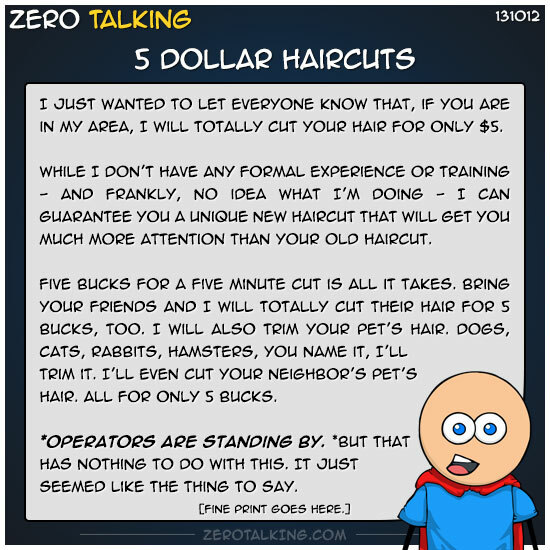 Five bucks for a five minute cut is all it takes. Bring your friends and I will totally cut their hair for 5 bucks, too. I will also trim your pet’s hair. Dogs, cats, rabbits, hamsters, you name it, I’ll trim it. I’ll even cut your neighbor’s pet’s hair. All for only 5 bucks. *But that has nothing to do with this. It just seemed like the thing to say.